Some time ago, at the end of my working day as a special needs assistant in a school for children with autism, I found myself considering a pair of small objects. Ostensibly, these objects were very similar. They were made by hand using a type of modelling clay called Fimo, which is basically a fancy plasticine, and were each about two inches in length. Both were representations of Gromit, the famous dog from the stop motion Wallace and Gromit films. I say ostensibly, because qualitatively, there was a significant and complete order of difference between them. This was amazing to me because I could not put my finger on what it was, what tiny adjustment of the clay, what fractional detail, or details, caused one of them to be something that the other was not. I turned them over in my fingers, and it seemed to me that one was a likeness and nothing more, impressive and accurate. But the other was… well, it was something more. What caused this phenomenal and total difference? The question burned, and without an immediate answer, it seemed to me like magic. Now, I had something to go on in my search for an answer. I had observed the genesis of both Gromits, at the hands of their separate creators, who were very different from each other. The more ordinary of the two Gromits was made by someone like myself, a Special Needs Assistant working in the school. Inspired by the boy’s efforts, this man in his twenties with a clear knack for arts and crafts had picked up the Fimo and whiled away his wet lunch break working on the figure. To get it right, he worked from a variety of models, a Wallace and Gromit magazine, and some Google image search results. He was proud of his finished work, enough to snap a cheeky picture of it on a digital camera to send on to his girlfriend, before he laid it with ceremony on a little bed of bunched up lilac crepe paper in a desk drawer. And in fairness, by itself, his finished figure was impressive. It was accurate in its proportions, its colour and its pose. Yet, later that day, when I retrieved it from its lilac safe place so I could compare it with the less ordinary of the two Gromits, it looked lifeless next to its partner. That Gromit, the artful one, had been made by a fourteen year old boy with autism. This child, let’s call him Daniel, did not have expressive language as we know it, but he nevertheless communicated a profound intelligence and charisma through a presence full of quirk and charm. He also had a capability for artistic expression, for drawing scenes from his favourite cartoons, The Care Bears, Wallace and Gromit and The Snorks. This capability endeared him to me, with my own limited artistic facilities. But his drawings were not perfect. In fact, they compelled me because of their awkwardness. They contained a full range of crayola colour, and they were never less than vibrant, but there was always something peculiarly frustrated and distorted about them. It was as if he were trying to represent the totality of something three dimensional in two dimensions. Not being Picasso or George Braque, he had no liberating method, such as cubism, to solve his problem. Then, one afternoon, after a teacher presented him with Fimo, he began working in three dimensions. He just started making these figures, one after the other. Gromit was the first of them, and I believe it was his first three dimensional work, because his mother communicated the same in his homework journal after we sent the figures home at the end of his initial fecund week working with the material. During that week he churned out one after the other of these things, a rich pageant in miniature: of Gromit, various Snorks, Olaf from Frozen, Lionheart from The Care Bears, and myriad others from eighties cartoons that I only have a passing acquaintance with, if any, such as the Brave Little Toaster and Denver the Last Dinosaur. By the end of two weeks he had made enough of them to fill a lunch box, which we called his model box. They were all quite perfectly finished, perfect from the start, from Gromit. How clearly I remember the afternoon he made the figure, the immediate interest he took in the Fimo substance. With no prompting or cajoling, he peeled off a few strips and began to test it between his fingers—not with force, but with delicacy—rolling it, pressing it, changing the shape of it with small amounts of pressure. You could see something dawn on him—plasticity, the material’s ability to take on any shape, its inherent potential. He wore glasses, and would tilt and angle his head, and look down the lenses, scrutinising the material so carefully, like a watchmaker at work. After that, it was almost as if a shadow or film came up over his eye. He went inward, referring back to his mental image of the object, because, unlike the creator of the more ordinary Gromit, he worked from no visual cue, or at least none that we could see. I generally think it is risky to try to imagine what it is like to be inside the head of a person with autism, and that doing so has been the source of landfills of useless or even dangerous psychology studies. Yet how could I not speculate on what he could see, when he became inward? If I think of an object in my mind’s eye, what I see is inchoate, slippery and thin. If I go a step further and try to draw the object, the teapot in my mother’s kitchen in Kells, for example, what I draw will be a combination of vague details from the actual teapot, and generic teapot details, rote learned artistic signifiers from my drawing days—a handle goes here, a spout goes there. The finished piece will at best bear only a passing resemblance to the actual teapot. Whatever image Daniel had available to him was undoubtedly the object he was about to make, must have been perfect, three dimensional, and available to view from all angles, a crisp, high definition holographic Gromit, turning and turning in the psychic space of his mind’s eye. It had to be so, I thought, because the finished figure was perfectly realised in three dimensional space. No one part of it (you might expect the face, for example) had been worked with more attention than another, all were given equal importance. It had a remarkable surface unity. It also had that extra elusive something. Which brings me to the extra quality in his figures, the invisible spirit that seems to be magic because, though we have observed the accuracy of his perception, we are still no closer to what that something is. His Gromit works on two levels. The first is clear to me. It is an accurate representation of a figure to which he is drawn. The second is not so clear; it is where we enter a zone of mystery and speculation. I wonder whether the figure is an art object, whether the quality that makes it different from the more ordinary Gromit is whatever that quality is that makes the work of some sculptors and painters works of art while others are not? Something about the little figure transcends what it represents. I wonder if it is the quality that compels people with a sympathetic eye to stop dead, astounded, in front of Cezanne’s paintings in galleries, as Rilke once famously did? In the main, the philosophers, poets and critics who have attended to Cezanne’s work have agreed as to what that quality might be. It is the painter’s deep sympathy for the material world. In representing something with that eye, he transcended imitation or representation, and created a new, higher object, the objet d’art. As Cezanne said of his own work, ‘we are creating a piece of nature.’ It seems to me, that this cannot be done unless one finds both the object represented and the object one creates as sacred. It requires a double seeing. Here, I’ll suggest, lies the very crux of what makes Daniel’s figures so special. They are related by a common spirit that transcends what they represent. They exhibit evidence of that double seeing, the eye that loves both the object it is represents and the object it creates. I would go so far as to say they are sacred, like little totems. When I handle one, I want to make it a totem of my own, or put it on a key-ring, or cover it in varnish so it is never lost. It was not always so. Had he made his figures two years prior to when he did, I would have taken far less notice of them, but their creation coincided with a time of change in myself, a slow subtle shift in how I related to the world. Over the course of two years, I was slowly emerging from the solipsism of my youth, and taking more of an interest both in the material world and the world of art. In the midst of it all, I found in the poet John Ashbery the following lines, and thought, (though I am not quite in my late thirties yet), this is exactly it: ‘When one is in one’s late thirties, ordinary things—like a pebble or a glass of water—take on an expressive sheen. One wants to know more about them, and one is in turn lived by them.’ The visual art I took most interest in during the period tended towards still life, objects painted in such a way as to raise similar questions about the respective artists’ perceptual powers as those I’ve raised about Daniel’s. I was mesmerized by Zurbaran’s still life of four vessels, of their uncanny presence in front of that total black void, which seemed a metaphor in paint for the complete negation of matter. 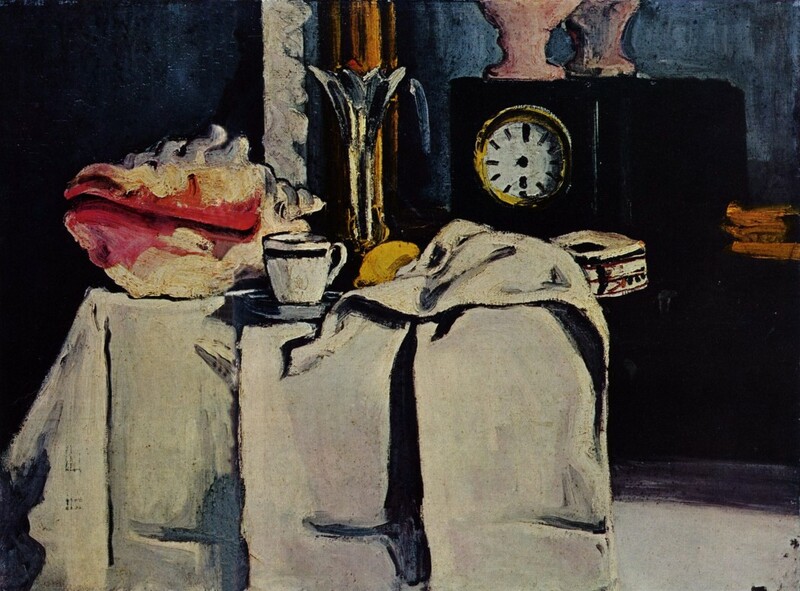 Cezanne too, of course, the strange portentous heft of his black marble clock, which doubles in the mirror behind it, its presence extending so strangely. At the same time, I meditated on things in the world around me, and dreamt impossible dreams of being able to see as those painters did, hanging onto that line of Ashbery’s, believing that it heralded some form of inner peace. Twice in my adult life, I have had an experience which I would call a peak sensory experience, something like Heidegger’s Dasein, where a web has appeared to lift, revealing the world naked before me, naked and aglow. Where I have seen, as Rilke puts it, ‘things sing of themselves.’ The second time was quite recently, as I lay in bed on a Spring evening, looking out my bedroom window. I watched as the cubic red brick chimney stack on the apartments across from me became tinged violet in the waning evening light, and I found myself suddenly not looking at a ‘chimney’ at all, but just a ‘thing,’ just matter, the mysterious stuff of reality. The two times this happened to me, I’ve thought the same thing—‘there are no words.’ It is the central problem in the work of certain painters and certain poets, the veils that fall between the actual objects out in the world and the perceiver. One veil is certainly perceptual habit, the visual shorthand I described in relation to my mother’s kettle. Another veil is language. I see things coated in words and meaning, an obscuring stubborn web, that cannot be scrubbed from the surface of things by ordinary means. Was what happened to the chimney therefore a clue as to what the world, stripped bare of language, might look like to him? To tell the truth, I sometimes envy his perception. I can’t help but feel that he is closer to the material world than most of us, that he somehow perceives things in a way—I’ll dare say it—even painters like Cezanne struggle towards throughout their lives… But that is ultimately to speculate. I can never and will never know the boy in that way. What I do believe, however, is that his figures are sacred. There are no two ways about it. Epilogue. A few weeks before I encountered Gromit, I holidayed in Berlin with my girlfriend Antoinette. We visited the Nationalgalerie, because I wanted to see Caspar David Friedrich’s Riesengebirge, a painting I had made my Facebook header image because of the sense of airy serenity it impressed on me. We saw that painting, and others by Bonnard and Cezanne, but it was not to any painting that our conversations turned later that day. It was to an exhibition of animal sculptures that was showing in the gallery at the same time, modernist bronzes, made by an Italian artist called Rembrandt Bugatti. There was an entire menagerie of these animals, a hippo, an elephant, a panther, flamingos. We walked around them rapt, and spent most of our time in the gallery looking at them. Later that evening, standing at a pedestrian crossing, our conversation turned to them for the third or fourth time. Darragh McCausland is a writer from Kells, County Meath, based in Dublin. He has been published in the Dublin Review, and his story, ‘Medicine,’ was featured in gorse no. 3. He is finishing a collection of short stories and a novel.